Ernest William Chambers, Africana intellectual, has lived in the semi-segregated community of North Omaha, Nebraska for his entire life. A community activist in the 1960s, Chambers rode into office in the Nebraska State Legislature on the crest of new-black electoral power in 1970. As a state senator, Chambers made a profound impact upon international, national, and local politics, focusing his political savvy and skillful debate on revealing abuses of citizens of color by police and the courts. Much of the Senator’s time has been devoted to promoting human rights legislation. For over thirty years Chambers has written bills to stop police homicides of African people, demanded internal investigations by police departments, and insisted on an end to racial profiling and excessive use of force by officers. He also argued for the hiring of African American professors in the state’s university system and co-authored an early resolution for divestiture of Nebraska from apartheid South Africa’s monetary system. 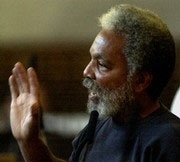 Senator Chambers had made his first anti-apartheid speech on the floor of the state legislature by 1979. With the passage of Chambers’ divestment resolution in 1980, Nebraska became the first state in the nation to begin withdrawing their financial investments from apartheid South Africa. Nebraska’s Divestment Resolution changed history as other states quickly followed, and the United States’ withdrawal of support sped the demise of South Africa’s white minority government. A community man, Chambers has spent his life fighting, locally and globally, for laws and policies which reflect the interests of his Africana constituency. Tekla Ali Johnson, “The Impact of the South African Liberation Struggle on Pan-African Praxis in the United States: A Pedagogical Study.” SERSAS Online Papers. Spring 2004. http://www.ecu.edu/african/sersas/Papers/JohnsonTeklaAliSpring2004.htm> (19 April 2004).